It's incredibly hard to believe that this trip is ending. It's even harder to believe that I didn't know any of these wonderful people with whom I have been with for 24 hours a day. Now, I'm leaving with the best of memories and adventures of spectacular countries and cities in Europe. It was a shock for us all as today was our last day in Prague. Although I am excited to come home, it's still bittersweet to leave such an amazing experience. The breakfast at Hotel Ibis was excellent! We had a nice selection of warm and cold foods. The hotel itself also had free internet and was close to the supermarket and metro. 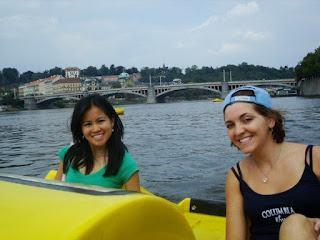 Liz Issac, Ericka Starr, and I definitely had to ride the paddleboats under the Charles Bridge today. Another life goal to complete: ride a jazz boat in Prague! We spent the day doing what we're best at: shopping! I got a great belt for about 5 US dollars and of course, another shot glass. Tip #9: Use your card to withdraw at the ATMs. In the event that your card gets rejected, move on to the next! If you don't, your card can and will be eaten by the machine! We had our last dinner at Michaels (sad!) where I definitely got pulled up onstage to dance with the old male performer. Good times! We had a simple night at a bar. As there were 2 shuttles leaving for the airport the next morning, half the group had to say goodbye to the other. It was surely sad, but we'll always be connected to each other through this fabulous experience! Centre of Prague with the boss! 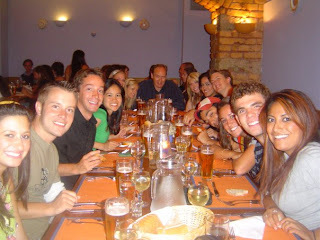 The Contiki group one last time! THANKS FOR A GREAT TIME, EUROPE! Until I return you will be missed! 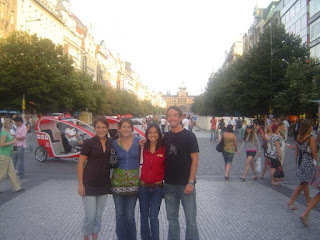 Day 10: Prague--I'm Liking It! I had no clue what to expect from the Czech Republic, but only really that it was beautiful. 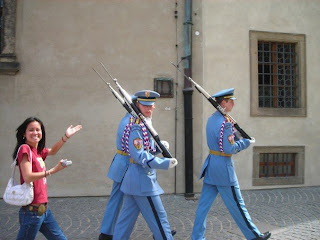 Of course, the #1 tourist attraction was Prague Castle and its guards. The city's cobble stone streets, along with its classic views, make it timeless. 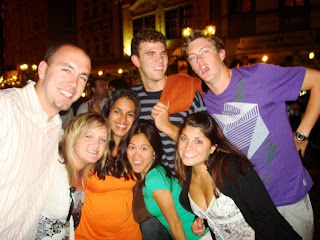 I think this belongs in a Contiki travel brochure! I shouldn't have done this. Notice Guard 1 giving me a death glare! Ashley, Zach, Nikki and I ate the most delicious dinner at Hotel U Prince all for a fantastic price of no more than 15 euros. Tip #7: Do NOT ask for split checks or really special requests in this country. The waiters will be angry and might as well eat you alive. At Nightclub Coyote, there are 5 levels of dancing--no euros and of course, no id check! Tip #8: The metro closes at 12:30PM, so you should be ready to take taxis! Also, they like to "bargain" their cab prices over there, so just make sure that the meter is on and that you pay that price. Ryan (our amazing tour guide) surprised us once more! On our way to Germany, we stopped by the Swarovski's headquarters--home of some of the most beautiful crystal collections in the world. There's even a pretty sweet zipline outside the headquarters! Crystals at Swarovski headquaters. Fancy! Another stop we took was to Camp Dachau, the first Nazi concentration camp. It was a very powerful experience nothing short of intense. We saw the barracks where people would have to sleep (sometimes up to 10 people in each) and even more ominous, the gas chambers. An incredibly moving experience and pictures will not be posted due to obvious reasons. As we got back on the bus, we listened to "The Sunscreen Song" which caused some people to cry. Very touching. Once we reached Munich, I had to try some bratwurst. The girls and I went shopping down Tal Street. Tip #6: Try the grapes at the sidewalk fruit stands! They're so full and delicious! We had a delicious dinner at Hofbraubraus along with a folk culture show. Downstairs at the beer gardent, we met a girl from Baltimore and a guy from Turkey (so random!). We also had some 14-year-old Italian boys hitting on us. Haha. That provided a good laugh! We ended the night with more clubbing, of course! At Cult Fabric (sp? ), there are about 30 nightclubs stuck in a run-down, but vibrant district. Club Willentos and all its glory! After getting a chance to finally sleep in, we had our first warm breakfast of eggs and bacon. We then slapped on some sunscreen and put on our helmets for some mountain biking all around Tyrol. Usually, I can't stand cycling, but did I love it today! Nice trails and long downhills (and the fact that I was in Austria) definitely added to my new affinity. We headed to a restaurant at the top of a hill and had a traditional luncheon of Austrian/German lunch of sausage and potatoes. Mmm...yay for sour cream and sausages! Finally, a place in Europa with some ketchup! Liz Olden and I explored the city upon our arrival. I got some caramel ice cream for only 2 Euros. Apparently, they make the ice cream for you on the spot like a push pop! It was delicious. They make ice cream on the spot! The ice cream vendor pushes it through like a push pop. 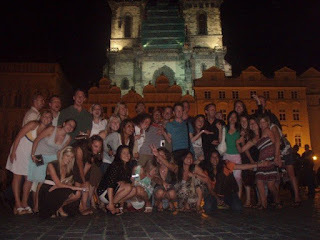 The night ended with a Contiki "Pimps and Hos" party! Met some nice Australians and Canadians. Man, oh man. Good times! We'll just leave it at that.